Many countries may block certain videos on sites like YouTube for one reason or another. If you live in a country like Germany, Spain or the Netherlands, you may not be able to get the full experience out of YouTube because of these restrictions. ProxTube comes to the rescue. ProxTube is an add-on for newer versions of Firefox. What it does, in a nutshell, is allows you to watch the videos blocked in your locality. Right now it works in Germany, the Netherlands and Spain. More countries will be added in the future. This Firefox add-on currently will not free up blocked YouTube videos in the US. There isn’t much to using ProxTube. 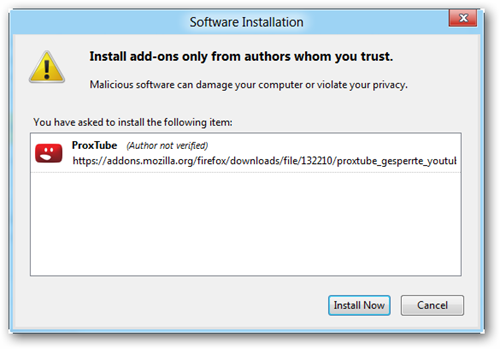 Once you install ProxTube, Firefox will restart. There will be a new icon in your Firefox navigation bar. This is your on/off switch. When you come across a YouTube video that will not play because it is not available in your country, you can toggle on ProxTube to play it. The way ProxTube makes the videos work is not magic. Well, it may seem like magic , but is a simple fix really. What happens is, When you click the icon in the navigation bar, the page itself is loaded like you are in the US accessing the video from an American proxy server. The video is not loaded via the American server to help the speed. Why are some of the videos blocked? There are lots of reasons a video may be blocked, but the usual reason is due to copyright laws. That’s why some videos may not be available in some countries and why this plugin was created. 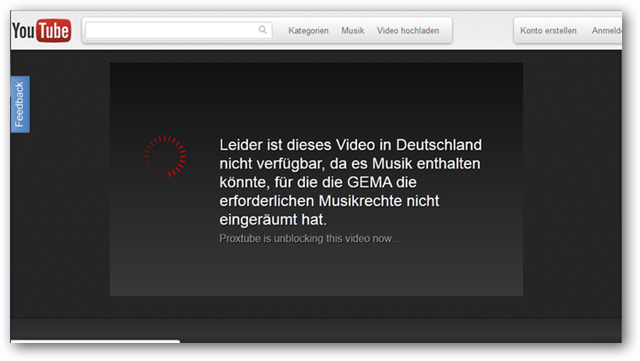 GEMA, the copyright police over in Germany, is the group saying what videos are okay to watch on YouTube and which are in violation of copyright laws. If you are in a country that has strict regulations on which YouTube videos you can and cannot watch, you will want to give ProxTube a whirl and see if it frees up some of those videos you are trying to watch. While there are not too many similar Firefox add-ons like ProxyTube, This one is rare because it does not take you to another site to view the video. You are kept on the YouTube page, it is just loaded a little differently.